Don't forget the littlest heroes! Last year my daughter's school had a super hero themed Spirit day where kids could dress like their favorite super hero to show support for the school's sport teams. Of course having an abundance of felt on hand, I whipped up my daughter a pink handmade super hero cape with a large letter for her first name on the back. There are many, many craft tutorials out there on how to make super hero capes for kids so I didn't feel the need to write a new one for you. However, I thought I'd pass along this idea which sprung from my daughter's creative mind and love for plushies. My daughter insisted that we also make several mini capes for her little tribe of stuffed animal super heroes. For small to medium sized stuffed animals, you can use a standard craft felt sheet to cut out a curved triangle shape (kind of like the shape of a piece of candy corn). Then, about an inch or so from the pointed end, cut out a small circle. Make the circle just big enough to fit over the head of your plushie or doll. If your animal happens to have a giant head, you can always cut a slit at the top of the circle and use sticky-backed Velcro tabs to reconnect the sides. 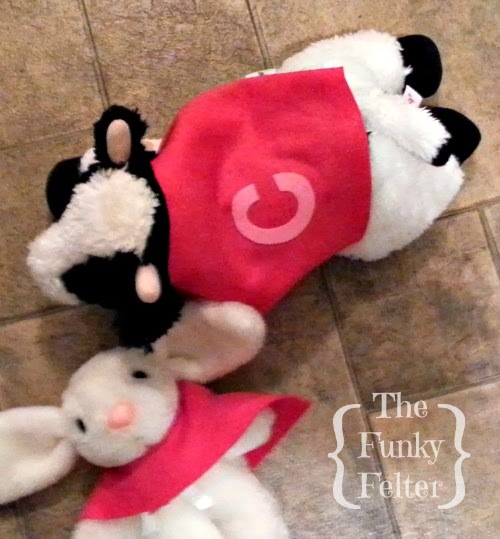 We also cut out small letters for the backs of their capes like in the photo above - "c" for cow! For the letters, we used some iron-on fabric adhesive on felt scraps and then traced letters onto the felt. Cut them out and ironed them onto the cape backs. Be careful ironing craft felt sheets though as they can melt with a direct hot iron. You can either lower the iron setting or use a cloth in between the iron and felt to avoid this. You won't have this problem if you use 100% wool felt, but most commercial felt craft sheets are actually made of acrylic, polyester or another synthetic blend. There's nothing wrong with using these type of sheets, just be careful when applying heat. Whether your kiddos plan to be super heroes this Halloween or something else entirely, these handmade mini capes are quick and easy to create. They are also a fun project to do with your kids. My daughter loved helping me trace the letters and cut them out. Now our household is protected by an entire little tribe of super heroes too!